Cab has steel roof, acoustical headliner, front windshield glass, electric wiper, supporting corner posts, steel frame door (LH Only) covered with vinyl and rear vinyl curtains. Cab is not ROPS certified, but fits over the existing, un-modified factory ROPS. 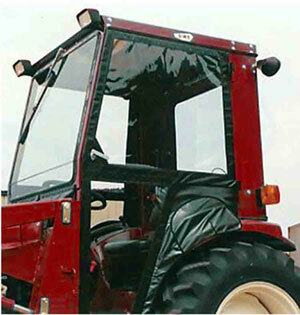 Special Fit-up Notes: This cab will fit bare tractors or tractors with a factory loader. This cab Does Not Fit Farmall Series. CLEARANCE PRICING! : All Sales Final. (Some items may have cosmetic defects). Offer valid only while quantities last. Enter the promotional code "clearance" in the Promo code box to see discounted pricing.